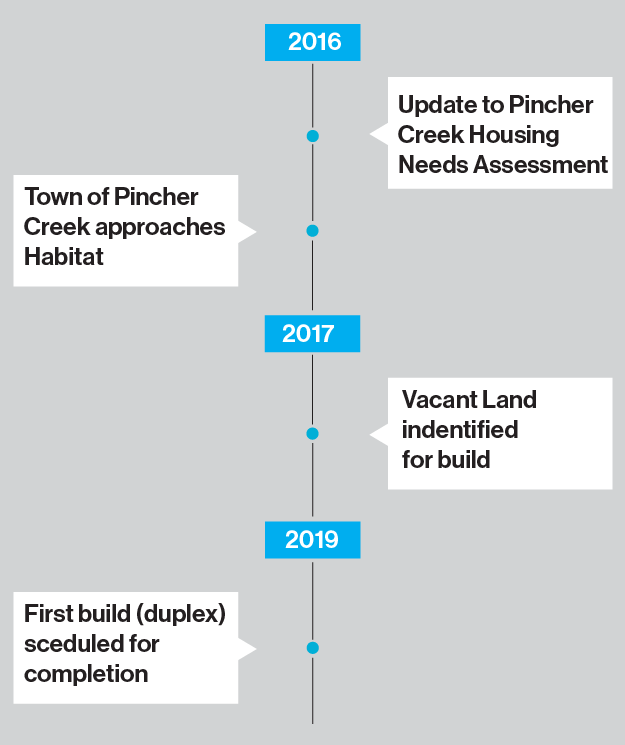 As a result of the Housing Needs Assessment in 2016, the Town of Pincher Creek approached Habitat for Humanity Southern Alberta to explore the feasibility and suitability of a Habitat build in their community. Vacant land owned by the Town at 995 Dupuy Street was identified in the spring of 2017 for donation to Habitat Southern Alberta for the build. The Town invited the Elks to lead a group of the local Service Clubs and Community Groups to raise funds and gifts in kind of approximately $120,000 for the future build. The community plans to raise the funds and be prepared to build a duplex in summer of 2019.